Though there are many ways to approach innovation, the majority of companies focus on building innovation teams or “Innovation centers of excellence,” as well as fostering internal education, before moving toward external deployments. 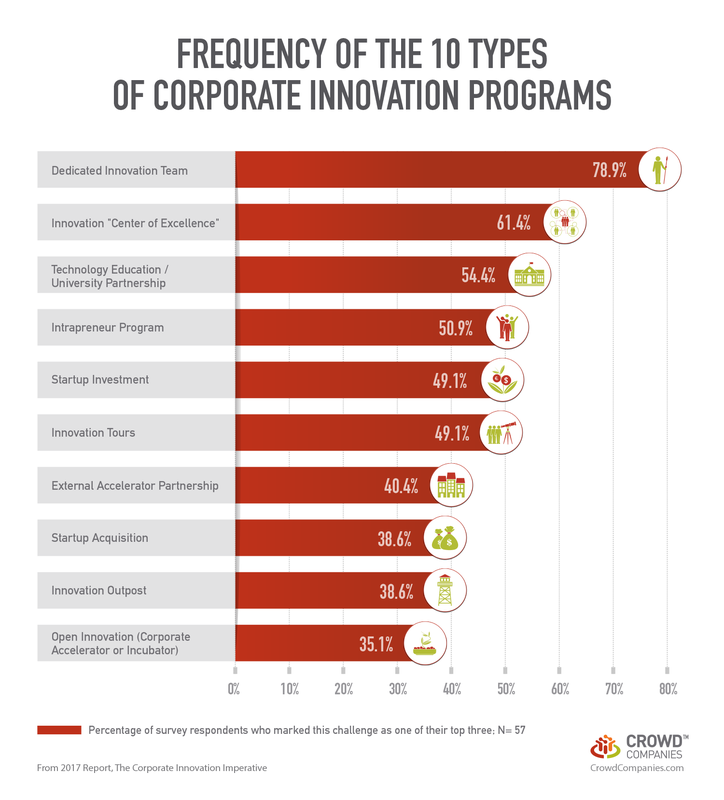 In Crowd Companies’ recent report, The Corporate Innovation Imperative (download here), we identify 10 types of innovation programs corporations pursue when looking to evolve their business models, customer experiences, operations, or products and services. More on the 10 programs can be found here. We discovered that corporations often excel in one program initially, then add programs to their innovation portfolio as they mature and are able to justify related expenditures. And, where do they begin? With their own teams. Through our survey, we found that dedicated innovation teams (79%), innovation “centers of excellence” (61%), and technology education / university partnerships (54%) are the most commonly deployed corporate innovation programs (see figure below). This shows that companies are first focusing internally on building the right teams, getting governance and processes in place, and educating current and new employees on emerging technologies before spending time and resources on rolling out external programs or investing in the startup scene. One way corporations are focusing on building strong teams is by involving cross-departmental constituents in their efforts. This smooths the path to internal acceptance and adoption as advocates are in every corner of the organization. Much of the success of innovation teams depends on internal alignment among tangential departments, like legal and marketing, to move from ideation through implementation. Verizon recommends bringing new ideas and developments to lawyers early, who can help obtain and protect intellectual property rights in a fast-changing global legal landscape. Innovation teams should also have their own marketing and PR resources, as Mastercard Labs does, to socialize ideas internally and externally, when appropriate, pick up sponsorship, build momentum, and identify pilot customers. Mastercard Labs also produces its own 60-second “pitch” videos for each idea that makes it to prototype, as an easy way to promote viral sharing within the company. How is your company approaching corporate innovation? Are you looking to build teams and foster education before looking outward to bolster innovation?